AT&T Inc. is an American multinational telecommunications corporation, and is the largest provider of fixed telephone service in the United States. AT&T also provides mobile telephone services and broadband subscription television services. Being socially responsible is business as usual for AT&T, and they weave it into virtually everything they do. CEO and Chairman Randall Stephenson has signed off on an ambitious policy to reduce the company’s carbon footprint by 20% by 2020. In 2013 the AT&T energy team decided to optimize the energy performance across 1,000 of their largest energy-consuming sites and 500 of their retail sites. This opportunity allowed the energy team to investigate the possibility of using advanced technology to lower energy consumption in an intelligent way. Enlighted recommended proceeding initially with an aggressive schedule of retrofitting a select set of AT&T properties by replacing all florescent light fixtures with new energy-saving LED lighting equipped with Enlighted’s advanced lighting control system. 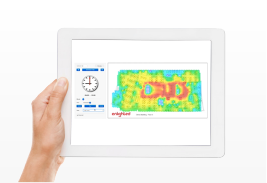 Enlighted’s advanced sensor system is able to expand to other areas of facilities control, such as HVAC and building security in the future – without upgrading the sensor. 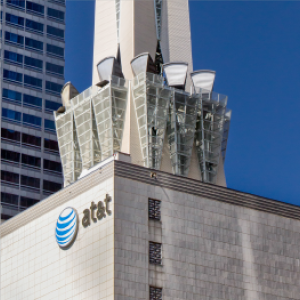 The retrofit focused initially on 240 properties or 20 million square feet of AT&T’s facilities. Enlighted’s goal for the overall project is to retrofit all 120 million square feet of AT&T’s real estate. The size and scope of the Enlighted retrofit project for AT&T’s initial Energy Scorecard plan was sizeable. To help AT&T make the decision to move ahead with the project, Enlighted recommended its GEO service as a way to manage and maintain. The GEO program also allowed AT&T to recognize immediate energy savings from the project while paying for the installation through energy savings over time. AT&T estimates that the initial 20 million square foot retrofit project is saving the company around $8 million a year in lighting energy expense. Once the rollout is complete across their entire portfolio, Enlighted’s system could reduce AT&T’s energy consumption by 195 gigawatt-hours—which could net the firm $200 million in cost savings over a span of 10 years. AT&T was so impressed with financial results of the relationship with Enlighted, they awarded the company its coveted AT&T Supplier Sustainability award in the category of Energy Efficiency for 2014. AT&T was so impressed with the financial results of the relationship with Enlighted, they awarded the company its coveted AT&T Supplier Sustainability award in the category of Energy Efficiency for 2014.